The boat that capsized on Saturday, killing over 30 on board was yesterday retrieved by the various teams that include the Police and UPDF Marine Units, Ministry of Works with the help of MV Kalangala and other members of the civil society groups and notable among them is socialite Brian Kirumira aka Bryan White. Some legislators that include the Kampala Central MP Mohammed Nsereko were wondering how and why "White Man" as he referred to him were ordering security personnel and other professionals on what to do. Bryan White proposed that the wreckage be pulled out with ropes and hired some able bodied men to help with the pulling, but that failed terribly prompting the police to use an excavator to help retrieve the wreckage. During all this Bryan White was on a police boat participating in everything and in some instances giving orders. "A civilian ordering the special forces, I don't know his name I think White Man, ordering people to pull a wreckage with a rope meant to pull cows!" "We have well trained engineers, we have better people in this country, we do not underestimate everyone's efforts in trying to do a rescue, but when it gets to that level, there must be a chain of command," Hon. Nsereko roared. Bryan White came out to defend his role in the rescue and retrieval exercise. "I'm working as a normal Ugandan because following what happened, you do not need to be called upon, it is the same thing with commiserating with one who has lost a dear one." The Director of operations, Asumani Mugenyi came out to explain clearly that volunteers who were part of the civil society are working hand in hand with the Uganda police and other key stakeholders to help out. However, some legislators had diverging views about Bryan White's involvement. "When police is commanding Wanaichi to do things, villagers say the police is commanding them, now villagers are commanding the police to pull out the wreckage, they are saying it is bad, what do Ugandans want," One legislator noted. 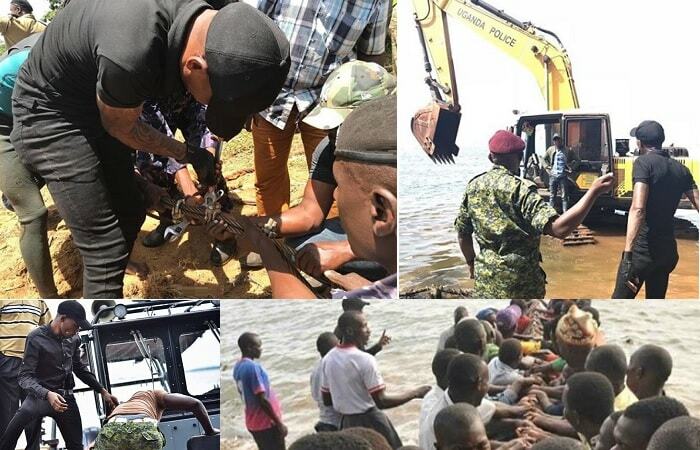 The Uganda Police PRO in a press statement issued thanked all the teams involved in pulling the boat wreckage and among them were Hajj Yusu Matovu aka Youma, Bryan White, Ministry of Works and the District leadership of Mukono.